Courts • Owner of dog shot by officers during search won't accept settlement. 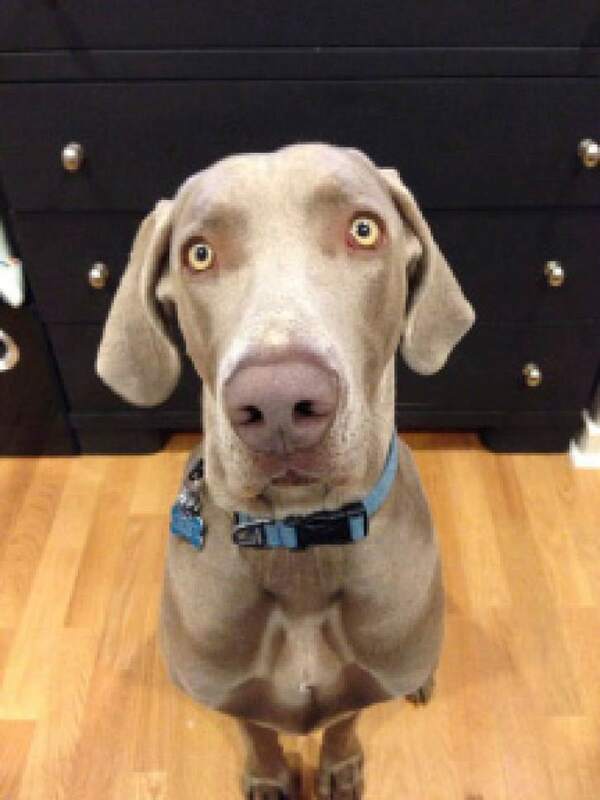 | Courtesy KUTV Channel 2 Geist, a 110-pound Weimaraner, was shot by Salt Lake City police as they were searching for a missing child. 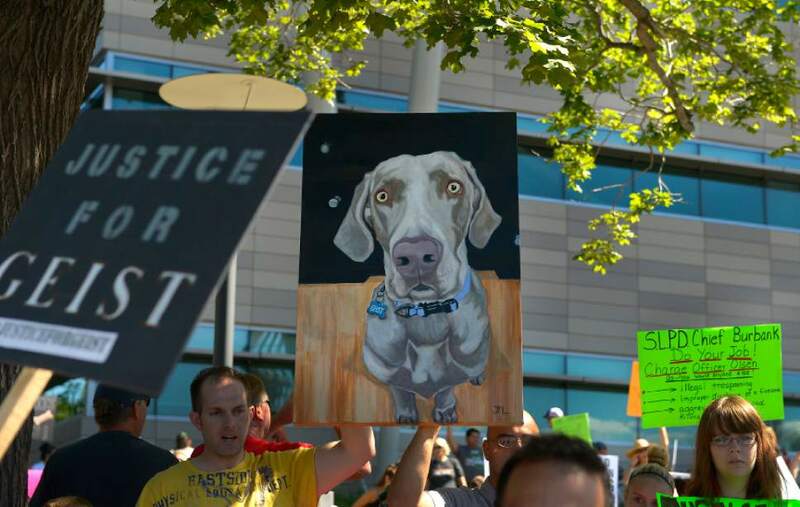 Leah Hogsten | Tribune file photo Salt Lake City earlier released the Police Civilian Review Board report into the shooting of the dog Geist, but had withheld the PCRB report into the Dillon Taylor shooting until Tuesday. Now, city officials say all such reports will be considered public unless their are special circumstances. In this file photo from June, marchers carried a portrait of Geist, who was shot during a police search for a missing child. 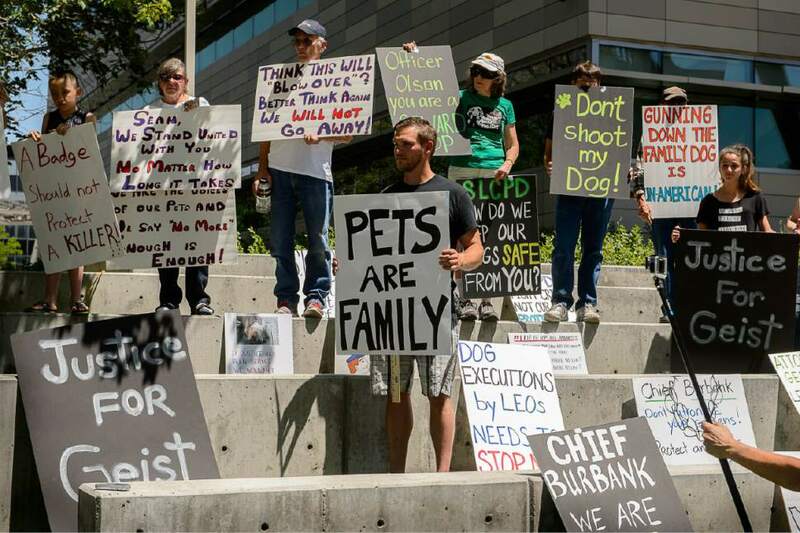 Trent Nelson | The Salt Lake Tribune About twenty people and a few pets rally outside Salt Lake City police headquarters , Thursday June 18, 2015, sympathizing with dog owner Sean Kendall, center, and calling for accountability from the department and the officer who fatally shot Kendall's Weimaraner one year ago. 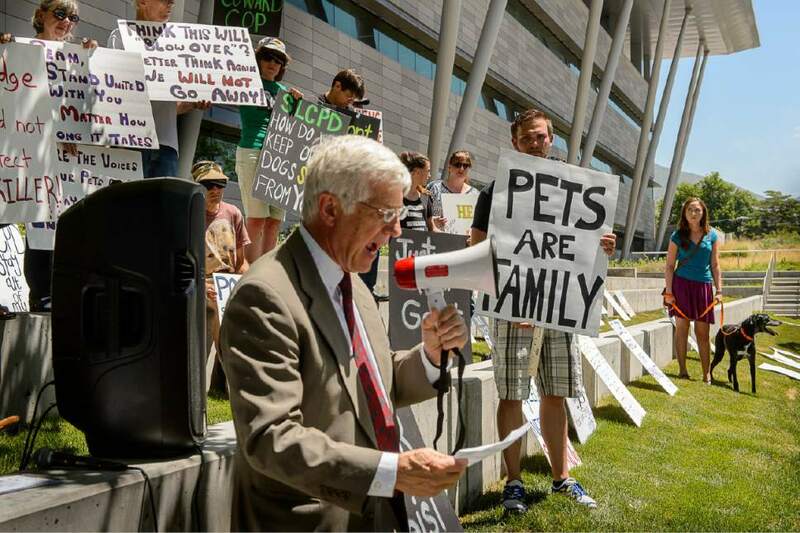 Trent Nelson | The Salt Lake Tribune Attorney Rocky Anderson speaks as twenty people and a few pets rally outside Salt Lake City police headquarters , Thursday June 18, 2015, sympathizing with dog owner Sean Kendall and calling for accountability from the department and the officer who fatally shot Kendall's Weimaraner one year ago. A lawsuit filed by the owner of Geist, a dog shot and killed by a police officer in 2014, will move forward. U.S. District Judge Robert Shelby rejected a request from Salt Lake City to dismiss Sean Kendall&apos;s lawsuit against the city and five police officers. The city had filed a request to dismiss Kendall&apos;s claim and require him to accept a $10,000 settlement, an amount the city said had been agreed upon. Officer Brett Olsen had entered Kendall&apos;s fenced backyard during a neighborhood search for a missing 3-year-old in June 2014. Geist, a 2-year-old, 200 pound Weimaraner barked and ran toward Olsen, who shot the dog. Kendall and the city negotiated a settlement of $10,000, but Kendall didn&apos;t sign the written agreement. After some back and forth, Kendall posted on his Facebook page that he wouldn&apos;t settle; in October 2015, he filed the lawsuit. The city filed a counterclaim in December 2015 to ask a federal judge to enforce the $10,000 settlement. Shelby ruled that actions by Kendall and the city didn&apos;t demonstrate a "meeting of the minds, and in fact indicated the opposite: It suggests neither party believed itself bound by the $10,000 oral agreement nor wished to be bound by the agreement." In his lawsuit, Kendall says the officer who shot Geist violated his Fourth Amendment right to protection from illegal search and seizure, as well as his Fifth Amendment right to due process when Olsen entered Kendall&apos;s yard without sufficient cause. Kendall is asking for $2 million in compensation for punitive damages for the alleged violation of his constitutional rights, loss and destruction of his property, pain and suffering, emotional trauma, loss of income and loss of companionship.